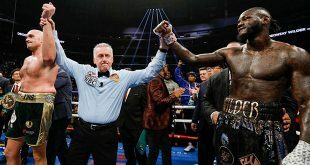 Last night at Planet Hollywood in Las Vegas, NV lightweight contender Breidis Prescott picked up his first pro loss at the hands of Mexican veteran Miguel Vazquez, who pounded out a split decision victory. Colombian bomb thrower Prescott, 21-1 (18), came into the bout best known for crushing Britain's heavily hyped Amir Khan last year and was favored to defeat Vazquez, 25-3 (12). 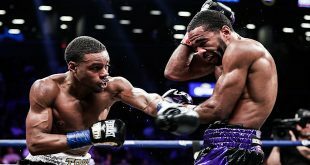 Prescott nearly pulled off another early stoppage when he decked his rival in the first but Vazquez, a career light welter/welter who's only losses had come at the hands of former IBF 140 pound champ Timothy Bradley and welterweight contender Saul Alvarez, got back up and went to work. After ten rounds, Vazquez had outboxed Prescott, taking two of the cards by scores of 96-93 and 95-94 while the Colombian won the third 97-92. Red hot Cuban light middle prospect Erislandy Lara, 7-0 (4), kept on track with a six round points verdict over Darnell Boon, 16-12-2 (6). 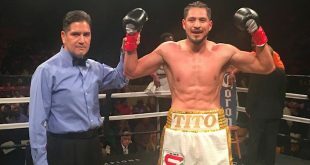 At the Civic Center in Kissimmee, FL Wilfredo Vasquez Jr, 16-0-1 (13), knocked out Cecilio Santos, 23-11-3 (13), in two for the WBO Latino super bantam strap. Former heavyweight contender Lance Whittaker, 33-5-1 (27), at six foot eight towered over ex-super middle Danny Batchelder, 25-7-1 (12), but had his hands full over ten rounds, eking out a 96-94 unanimous decision on all three cards at the Performing Arts Centre on Redondo Beach, CA.